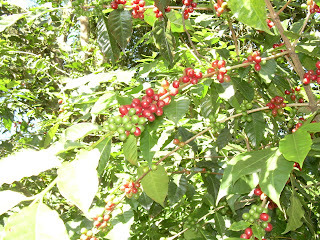 This was the first year we cropped coffee on our three hectares of coffee land in Coatepec. 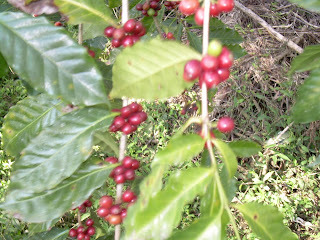 The picking took place in January. 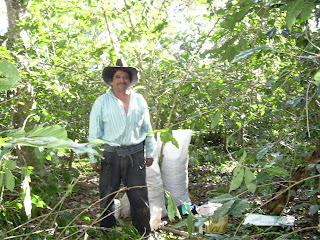 A small band of pickers was organised by our neighbour, Don Antonio, courtesy of our friend and immediate neighbour, Gabriel, who sold us the land and who kept one lot for his own family. 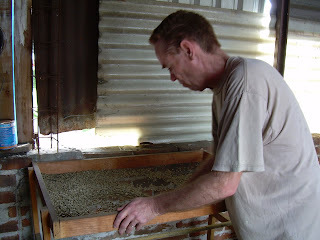 After the pickers had finished they held back 70 kgs of raw bean for us, sold the rest at the market, and then we divided the modest proceeds in half. They got half for doing the picking. 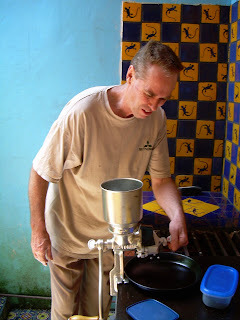 We kept half, and gave them some more for the 70 kgs we had held back. 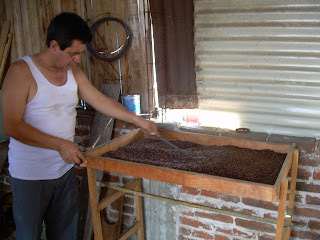 Michele then took the raw beans to Don Alfredo, courtesy of Dona Angelita (bless her). 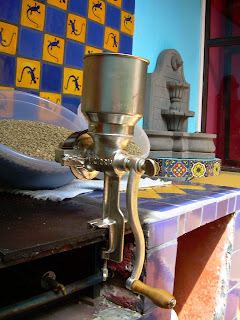 He had a machine -- called a pulpadora -- that took the "fruit" off the bean, leaving the slimy hard inside bit. 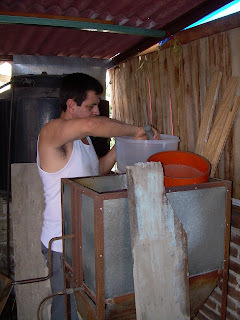 Michele washed them and got the slime off (fermentacion), and then spread the beans out in the gazebo up on the roof of our house to dry. When they were dried after a few days she brought them inside. I gathered them up in March when I returned from Oz and put them in containers to wait until summer. 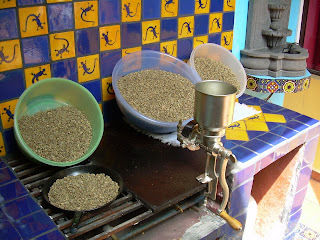 Summer arrived and we borrowed a grinding machine (molina) from Don Juan, who lives next to Dona Angelita. 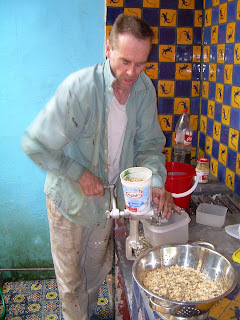 I husked the beans and with Dona Angelita's help we winnowed them. 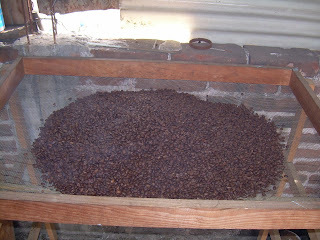 Then it was time for roasting. 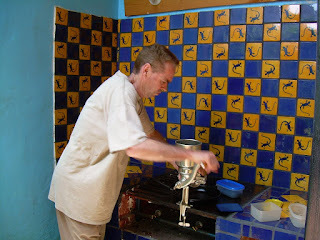 Jorge, one of Don Juan's sons did that, and showed us how to do it. We learned on the job. 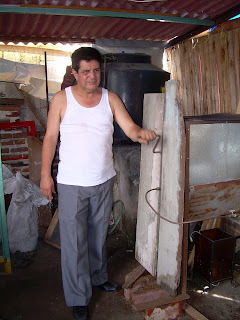 Jorge builds these machines, so he is building one for us to do our own roasting next year. We bought a sealing machine and Michele located bags in the markets. 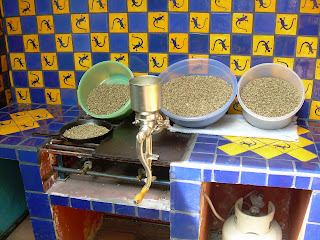 We filled some bags with whole beans, and I bought a molina and ground the rest of the beans. 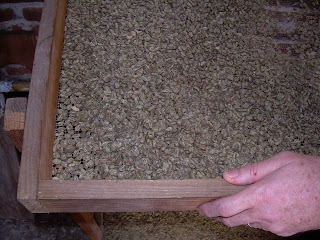 We then filled the remaining bags, sealed them, and the job was done. 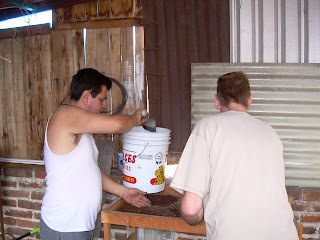 The following photos go through the entire process, from cropping to bagging.